THERMOFUEL V9 CLINICAL STRENGTH THERMOGENIC! 625 mg Acetyl-L-Carnitine - Without carnitine, fats cannot be metabolized. Carnitine escorts body fats to the mitochondria where they can be broken down. 500 mg Green Tea Leaf Extract - Massively ramps up the metabolism to speed up the fat-burning process while also releasing epinephrine to enhance focus and release body fat stores. 225 mg EGCG - Helps maintain a higher metabolism by keeping norepinephrine, the neurotransmitter responsible for regulating metabolism, at peak levels. 200 mg Caffeine Anhydrous and Infinergy™ DiCaffeine Malate - Caffeine is well known, but this is not your typical caffeine. The addition of malate to two caffeine molecules smooths any agitation from and prolongs the metabolic-boosting effects of caffeine. 60 mg Banaba Leaf Extract - Inhibits the uptake (digestion and absorption) of carbohydrates and can aid in their deposition into cells from the bloodstream, resulting in a reduction in blood sugar. 50 mg Cayenne Pepper - Promotes the mobilization of fats for energy production through a process called lipolysis and thermogenesis by generating heat in the body. 50 mg Theobromine - When theobromine is absorbed by the body, it activates an insulin-signaling pathway, which causes a mild increase in glucose uptake. What is the best way to take ThermoFuel V9? To assess your tolerance, take one capsule with 8 oz. of water once per day. Once your tolerance has been assessed, take 2 capsules 2 times daily, 30-60 minutes before meals. For best results, use for 8 weeks in conjunction with a calorie-reduced diet and regular exercise. Consume 8-10 glasses of water daily. Do not snack between meals. If you are sensitive to caffeine, do not take within 5 hours of bedtime. Fat burners are created for anyone trying to decrease body fat. They often have ingredients designed to enhance your metabolism and burn up stored fat. A fat burner can assist you greatly in getting into better shape and motivate you with quickly noticeable results. I see ThermoFuel V9 may help me increase my metabolism. What will that do for weight/fat loss? Anytime you have an increase in metabolism, your body will burn more calories at rest and during exercise. If you burn more calories than you consume on a daily basis, you will lose weight/fat over time. Thermogenesis is, in the simplest sense, the production of heat in the human body, which can have a calorie/fat burning effect. Can I stack my pre-workout with ThermoFuel V9? 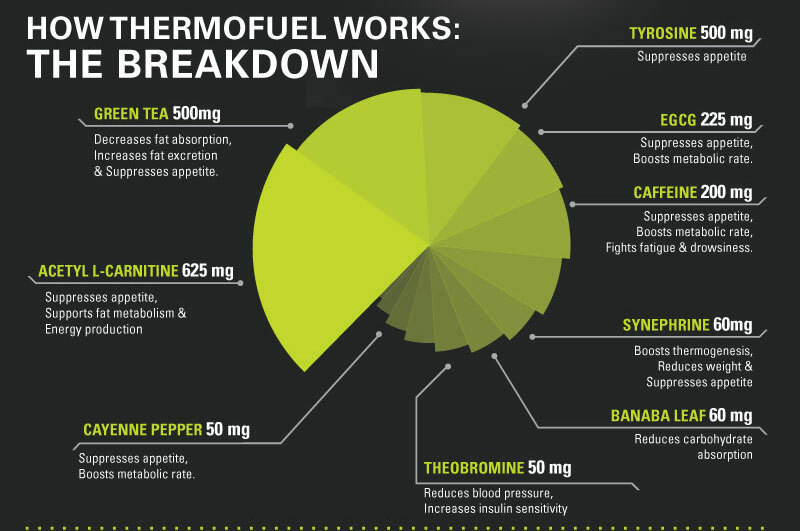 If your pre-workout does not contain any stimulants, it is ok to stack it with ThermoFuel V9. However, if your pre-workout contains high amounts of caffeine or other stimulants, we suggest not taking ThermoFuel with it unless they are taken 8 hours apart. What other NutraBio products do you recommend taking with ThermoFuel V9? In order to promote optimal fat loss and gains in lean muscle mass, we recommend stacking ThermoFuel with our 100% Whey Protein Isolate, IntraBlast, Reload, and MultiSport. Suggested Use: To assess your tolerance, take 2 capsules with 8 oz. of water once per day. Once your tolerance has been assessed, take 3 capsules 2 times daily 30-60 minutes before meals. For best results use for 8-12 weeks in conjunction with a calorie-reduced diet and regular exercise. Consume 8-10 glasses of water daily. Do not snack between meals. If you are sensitive to caffeine, do not take within 5 hours of bedtime. I'm a fan. I'm currently trying to drop quite a bit of weight and the combination of ThermoFuel, CLA and a new Gym habit have helped tremendously. I'll admit I'm still not too good at the "health eating" part which is critical, however I'm still dropping weight and gaining muscle. The boost in the morning is great as well as the boost in the afternoon. I've taken other Thermos before like OxyElite and Hydroxycut but the feeling I get from those is... I feel more like a maniac, jittery, anxious etc, which doesn't work out so well for me sitting at computers all day. Long story short, I just purchased my 3rd bottle and am anxious to get it, so far I'v gone from 240 lbs down to 213 lbs and a big help with that has been the ThermoFuel. I have been on this product for a couple of weeks. It does not make you loopy. You take it and you notice your belly gets a little warm but that is it. No Jitters! I have lost a couple of pounds so I assume it is working. My body has an annoying habit of plateauing at a certain weiight. This seems to have fixed that issue.